Making money is a good thing. Losing money is not, particularly when you're self-employed. But, of course, things are never that simple or black and white when it comes to tax law. All gains and losses are not created equally for tax purposes. They're classified as either "ordinary" or "capital" gains or losses. Gains and losses that are realized in the course of doing business and the sale of noncapital assets are typically ordinary. Those that result from selling or exchanging a capital asset are generally capital gains and capital losses. It can admittedly be confusing because different rules apply to each. What Are Noncapital and Capital Assets? As a general rule, anything you own for personal use or investment, such as stocks and bonds, is a capital asset. The sale of an otherwise capital asset can be treated as an ordinary gain or loss if the exchange is made to a related person, such as between the executor and the beneficiary of an estate or between you personally and your business entity. Ordinary losses are generally considered to be better than capital losses because they can be used to offset your other sources of income. Capital losses are more limited. They can only be used to offset capital gains and they're subject to a $3,000 cap per year as a tax deduction. Here's how it works. Let's say you have a capital gain of $5,000, and a capital loss of $15,000. You can net $5,000 of your loss against the gain, then you can take a $3,000 against your other income, leaving $7,000 that can't help you in any way in the current tax year. You would have to take that $7,000 over the next three years because of the $3,000 limit: $3,000 in year two, $3,000 in year three, and $1,000 in year four. But there's a flip side—the rate at which each type of gain is taxed. Ordinary gains are taxed as ordinary income along with everything else you earn and according to your tax bracket for that particular year. Capital gains are either long-term or short-term, depending on how long they're held. Assets held for a year or less are considered short-term and they, too, are taxed as ordinary income according to your tax bracket. But long-term gains, those resulting from assets owned for more than a year, are taxed at either 0, 15, or 20 percent for most taxpayers. That 20 percent rate is less than what many Americans can be expected to pay on ordinary income in 2018. A single taxpayer with income beginning at $38,701 will land in the 22 percent tax bracket in 2018, paying 22 percent more on ordinary gains as opposed to capital gains. The long-term capital gains tax rate is $0 for single taxpayers who earn up to $38,600. 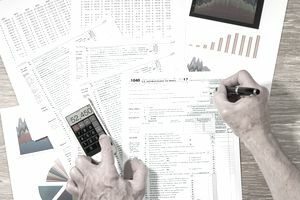 Depending on whether your profit or loss was related to your business or was personal, you would use either IRS Form 4797 or Schedule D to report it. You must report any profit or loss from the sale of assets used in your trade or business using Form 4797. Don't worry, it comes with line-by-line instructions. Otherwise, for personal assets, you would use Schedule D, "Capital Gains and Losses." If the same asset was used for both business and personal purposes, you must allocate any gain realized between Form 4797 and Schedule D. For example, you might use your home—which is depreciable—partly as a residence and partly as your office. If your office space takes up 10 percent of your home's total square footage, you would allocate 10 percent of your gain on Form 4797. The balance would be personal and would, therefore, be reported on Schedule D.
Gains on the sale of business assets that are not capital assets are ordinary gains and are taxed at ordinary income tax rates. These gains do not qualify for capital gains treatment. When you've completed Form 4797, enter your resulting gain or loss on line 14 of Form 1040. Then attach Form 4797 to your tax return. NOTE: Tax laws can change frequently and the above information may not reflect recent changes. Please consult with a tax professional for the most up-to-date advice before filing your tax return if you're dealing with ordinary vs. capital gains and are uncertain where you stand. The information contained in this article is not intended as tax advice and it is not a substitute for tax advice.